I’ve seen a lot of writers comparing Falling Red to Guns N’ Roses and I have to agree. Still, it’s a bit of a cliche these days to try draw lines to Appetite for Destruction, as in “this is the best debut since Appetite!”, “this generation’s Appetite!” and “not since Appetite has a debut sounded so dangerous!” Please. It unfairly raises expectations and casts a large shadow for these up ‘n’ coming bands. Let’s face it, no debut is going to equal or top that 1987 classic no matter what. 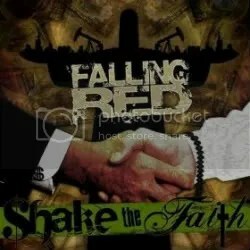 I guess what I’m trying to say is that Falling Red’s Shake the Faith stands on its own just fine, thank you. What the band does is join the likes of Charm City Devils, Backyard Babies, Vains of Jenna and The Last Vegas in keeping sleazy, punky old school rawk ‘n’ roll alive with this solid collection of decadent party rock. With the great revival of sleaze rock that we’ve seen in the past decade, there’s plenty of bands that fall into category of “mediocre”. Some new generation acts seem just as manufactured as the scene itself became during the late ’80s and early ’90s but that’s not the case with Falling Red. To be sure, while an enjoyable listen, this album breaks no new ground in the genre but what it does is lay down the foundation of what could become quite a legacy for this band that has a bright future. Their hearts are obviously in this. They aren’t just being “retro” for the sake of being retro and don’t become a parody of the scene. This group has the charisma, energy, riffs and sneering attitude that it takes to ascend to the top of the sleaze rock trash heap. Falling Red has quite a future and Shake the Faith confirms it.